If you missed part one – here it is. 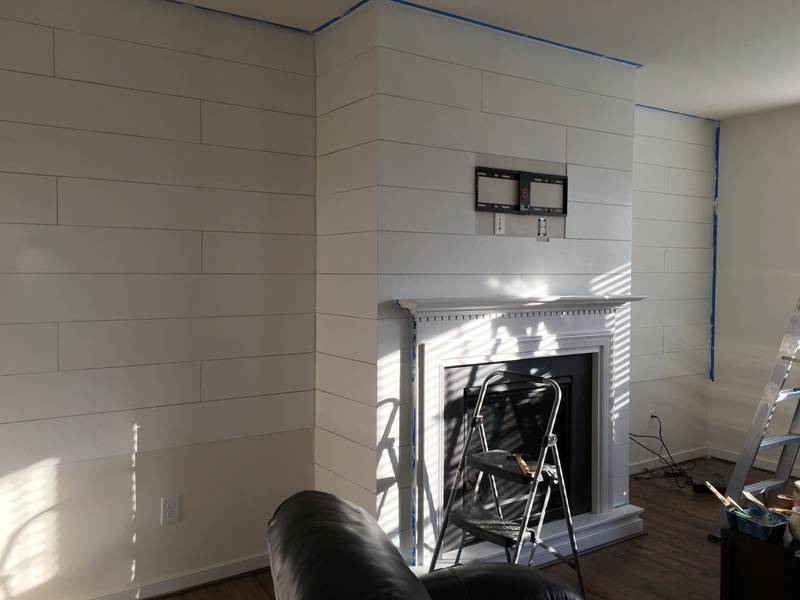 To recap, we’ve installed our shiplap to our fireplace wall and built-in walls and now it’s time to finish it out. Our first step was to hammer in all the nails so that they were flush with the shiplap. Because they didn’t look very noticeable, we chose not to use wood filler on all the nail holes like some tutorials. We did have to apply quite a bit of wood filler to our outer corners where there was a significant gap where the boards lined up. I used a spackle knife and spread the filler into the areas and scraped the excess away. Before letting it dry, I recommend taking a toothpick to get the filler out of your nickel-gapping or you’ll lose that beautiful gap you worked so hard for. Once dry, I sanded the area down until it felt smooth and level to the touch. You can take a small art paint brush to brush the powder out of your gaps. I also applied wood filler to a few areas where the veneer had chipped off badly at the end of a few boards. I applied the wood filler on the outer corners probably 3-4 rounds with sanding each time in between. It was very time consuming and very dusty. What complicated our project more was that the boards on the fireplace wall expand and shift when the fireplace is turned on. I had pretty much got everything smooth when I discovered this one day and it left a nice crack down each filled area. Looking back, I probably should’ve used caulk for this because it would’ve been more flexible but it’s too late now. I think if I notice it cracking again I’ll run a little caulk in the small gap. I next caulked wherever my boards met the ceiling or base molding and around the fireplace. Caulking can be messy if you wing it. I recommend taping your area off. It’s more time consuming but results in a neat and tidy caulk line. Place your tape as close to the edge of the board and leave 1/4 inch gap at the other tape strip from the corner. Run a bead of caulk into the corner and then use a finger to spread the caulk. Once done, quickly remove your tape. In areas where there was a larger gap I had to go back and apply a second round of caulk because when it dried it left a bubbly gap. Every single shiplap tutorial that I read did not mention how to paint shiplap. I originally thought I would paint the edges of each board before installing them but it was taking so long that I gave up. Little did I know painting the edges would take so much more time after they’re on the walls. So if you’re reading this and you only take 1 thing from this: PAINT THE EDGES OF THE BOARDS BEFORE YOU NAIL THEM UP. Here’s how I thought it would go: I thought I’d take my small trim paint brush, paint into all the cracks and then put on a few coats of paint using my roller. But when I took my trim brush and painted into the cracks – nothing happened. A very MINIMAL amount of paint went in there. I was stumped – now what? So Eric suggested I go ahead and roll on the paint and then see what it looked like. So I did. I put on 2 coats of paint and it looked good….from afar. But up close you could see the sides of each board were wood colored. Because of the angle of each of these cracks it was really only evident on the fireplace wall and at the boards near eye level on the other walls. So I went in again with my trim brush – loaded it up and jabbed it into those cracks. I followed up with a toothpick to get out excess paint and my trim brush to smooth the paint out. But it was only maybe 30% effective at getting paint in there. So then Eric suggested my little art paint brush. I tried it and it worked much better. But still – we’re talking real slow because I’m literally taking a paint brush the size of your pinky finger to paint little by little into these cracks. So I hit the high spots – the fireplace wall and especially those corners which were the most apparent and the boards at eye level on the other walls. I then followed up with 1 more coat of paint on the entire surface. 2 coats was close but 3 coats looks better. EDIT: After about a month, I noticed the color of the white had yellowed significantly. It was as if the wood was bleeding through. So I painted another 2 coats of paint and that seemed to do the trick. 5 coats of paint – really? Yes, really…ugggh. We’re very happy with how it looks and now we’re excited to get built-ins installed on either side of the fireplace to finish out the space. 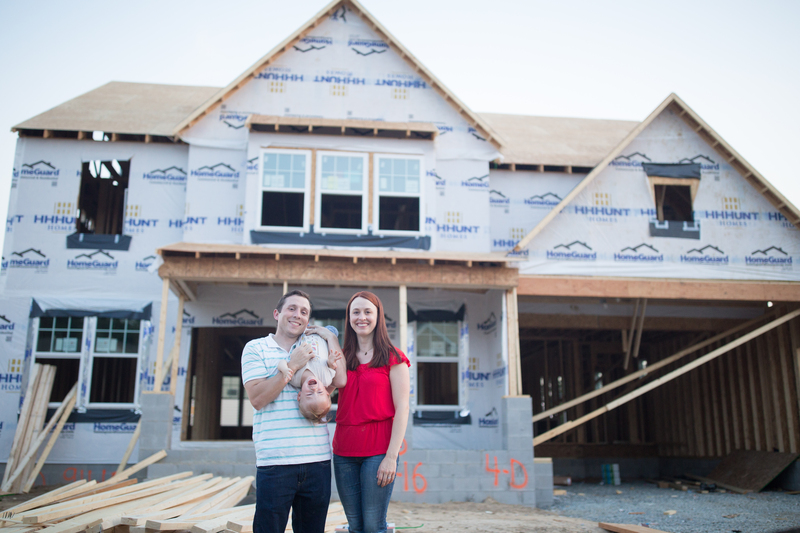 Nicole is a mom to 2 crazy kids, part-time physical therapist and full-time lover of bangin’ kitchens.